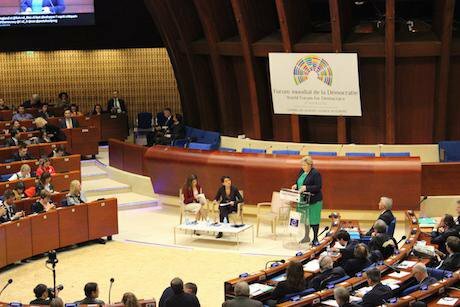 Erna Solberg at the World Forum for Democracy. Credit: Yasser Machat.Discussions about the long-term future often don’t seem politically convenient for the people elected to represent us. When you’re working on an election cycle, the ever present spectre of securing future electoral success incentivises decision makers to keep in step with public opinion, instead of raising the issues we must address for the future of people, society and planet. Too often we elect people so many of us are dissatisfied with and hope they’ll do the right thing. You could point to looming water scarcity as an indicator of this, or the seeming lack of preparedness across Europe for managing refugee crises. You could also point to past (and present) decisions around education that have arguably failed to prepare people today to be active citizens with the knowledge and skills to fully participate in a democratic society – along with systems that are designed to foster that participation. Where do you see the world in 5 years’ time? What about 10, or 50, or even 100? It might be a question we can answer in part, but how do we develop a collective vision for the direction that our society and planet should be heading? There’s an infinite number of possible outcomes and different steps we can take along the way. We should begin the process of planning for those possibilities now. Such planning requires education, the right tools and approaches, a civil society and grassroots movement, and decision makers’ willingness to change systems and to inform, listen and act. Strategic foresight and scenario planning are tools that could be utilised comprehensively, alongside participatory methods of policy and decision making, to involve the public in setting the vision. Some approaches are already used by governments, institutions and organisations around the world, but there is room to improve how the public are involved. The future is something we have touched on in our discussions at the World Forum for Democracy, and it’s clear that we have a lot to figure out. In the opening ceremony, Erna Solberg, Prime Minister of Norway said that the Sustainable Development Goals “are a roadmap to the future we want”. We have also heard that “the answer is not less democracy, but more democracy”. What that democracy looks like, however, is to be determined. With the World Values Survey finding rising support for authoritarian alternatives to current forms of government, how we use the tools at our disposal to support systematic change for a sustainable and equal future is an urgent question. We need to work on how we enable people to express what they want and expect to see, and how those in power listen to those views. Our current systems of representative democracy display a marked unresponsiveness to the issues many of us face; we need to imagine new ways of ‘doing democracy’. By involving citizens in futures thinking and scenario planning, we can go on a collective journey to understanding how and why decisions are made, furthering understanding of the complexity of decision making. This approach has the potential to strengthen trust in politics. There are a number of outliers and roadblocks on such a journey, of course, but it also provides space for feedback and explanation. It is crucial that our political systems become more participatory, and deliberative too. In both the recent UK Brexit vote and US presidential elections, voters chanted lines about making their respective countries ‘great’ again. What that greatness looked like, however, was not articulated as a clear vision for the future. Undertaking a wider campaign of work to understand what people mean when populism takes hold could help the grassroots and decision makers lay out a bolder vision for where they’re headed. Governments could demonstrate to voters more clearly the steps that need to be taken to get to their version of the future, whilst also educating people about the complexities of decision making. A future worth thinking about? It is important to acknowledge the difficulty of thinking about the future when the events of the present are pressing for so many. So much about this thinking seems abstract and detached from the reality of our daily lives. Musing about the ethics of artificial intelligence, reducing carbon emissions, bioethics, and all the other things that have the potential to cause social upheaval may not be high on your priority list when you’re struggling to keep a roof over your head or feed your family. This seems fair observation. As a young person living in the UK today, I feel that I need both the inspiration and a facilitated space to do that thinking, as well as the development of a political system that values my input so I am encouraged to continue participating. The policy positions of our Government makes the future feel uncertain for many young people; if you want people to think about the future, we need to have a future worth thinking about. Young people must be heavily involved in setting a vision for the future instead of being expected to run with what is handed to us, but it is a collective responsibility that does not fall on the shoulders of any one group. We need to view ourselves as part of a more connected community, otherwise we risk comfortable complacency. There is a strong argument for improving citizenship education to support these goals, but included in that there may be a needs to be support people to navigate ethical questions, and inspiration for different ways that the world could be. Involving people in discussing substantial issues, whilst also involving them in navigating ‘trade-offs’ and encouraging them to explore complexity, seems vital in the process of educating about politics. If we don’t address the issue of the future now, there is a danger that it will be designed by the people with the most capital and power, with reactionary approaches struggling to dismantle the systems that have incrementally developed over the years. Some might say we’re already at that point, but we know there are a gazillion more decisions to make. We can’t step back. We must keep an eye on the direction we’re heading and, where possible, push for collective input to shape it. So, where do you see the world in 5 years’ time? What about 10, or 50, or even 100? We have to talk about it, now.